UDM Downloads > WaveMaker MP3 to WAV Converter! WaveMaker MP3 to WAV Converter is an easy-to-use audio software that lets you convert files in MP3 format into CD quality standard PCM wave (.WAV) digital audio files. The software supports reliable and speedy batch-conversion of a thousand MP3 files into WAV format with a single button press. 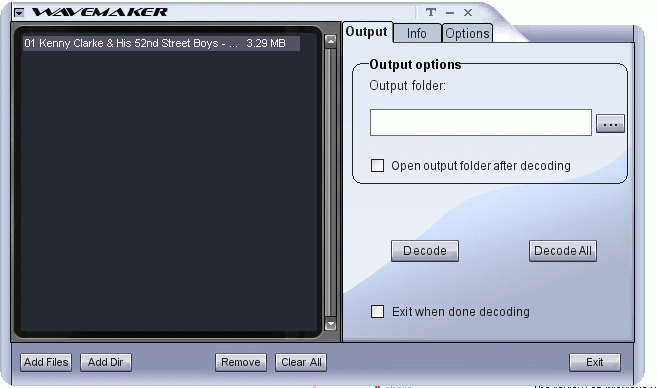 WaveMaker MP3 to WAV Converter also comes with some nifty features like fade-in and fade-out, normalize the volume on the output WAV file to a desirable level, and delete trailing and leading silence in a song. These features will help you record songs that conform to your preferred way of listening to music.